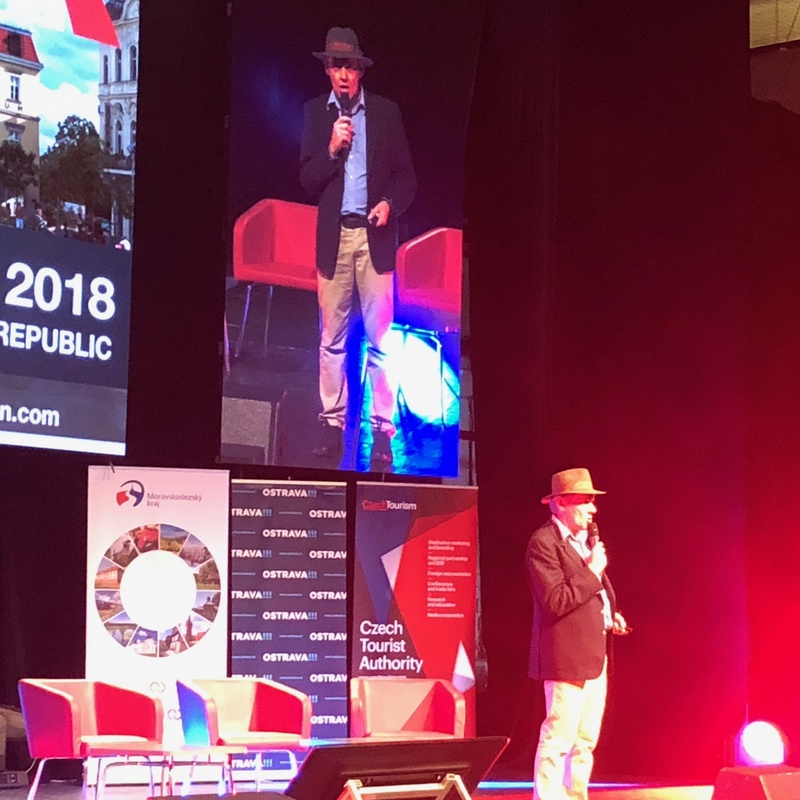 I’ve just returned to Prague from five days in Ostrava, where I spoke at the TBEX Europe 2018 conference of travel writers, bloggers, photographers, and influencers. It was exhausting, enlightening, and inspiring in equal measure. As a working travel writer, TBEX was always on my radar, but until this year, I'd never been actively involved. This blog changed that when the organizers, earlier this year, saw it and asked me to speak. 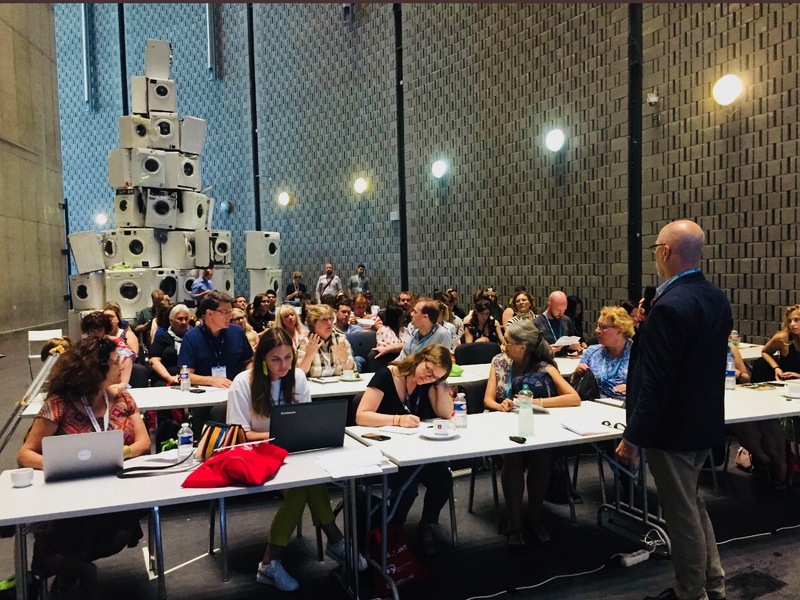 I was nervous at the prospect of addressing a room of bloggers, many of whom had far more experience at this than I did. I thought hard about my presentation and settled on a topic from a university lecture I give to help prospective travel-writers research new destinations. The conference organizers called it "Practical Tips for Bringing Destinations to Life." I call it "Seven Life Hacks for Travel Writers." This post will be a little schizophrenic. I'll use the photos to convey the flavor of the TBEX conference, which was fantastic. In the text, I'll summarize my presentation. Top Photo: Video journalists and YouTube phenoms Janek Rubeš (center) and Honza Mikulka (right) from the video series 'Honest Guide' gave the closing address. Their work, which has drawn millions of YouTube downloads from around the world, shows that a low budget is no barrier to producing inspired, popular, funny, and helpful travel content. Photo by Mark Baker. 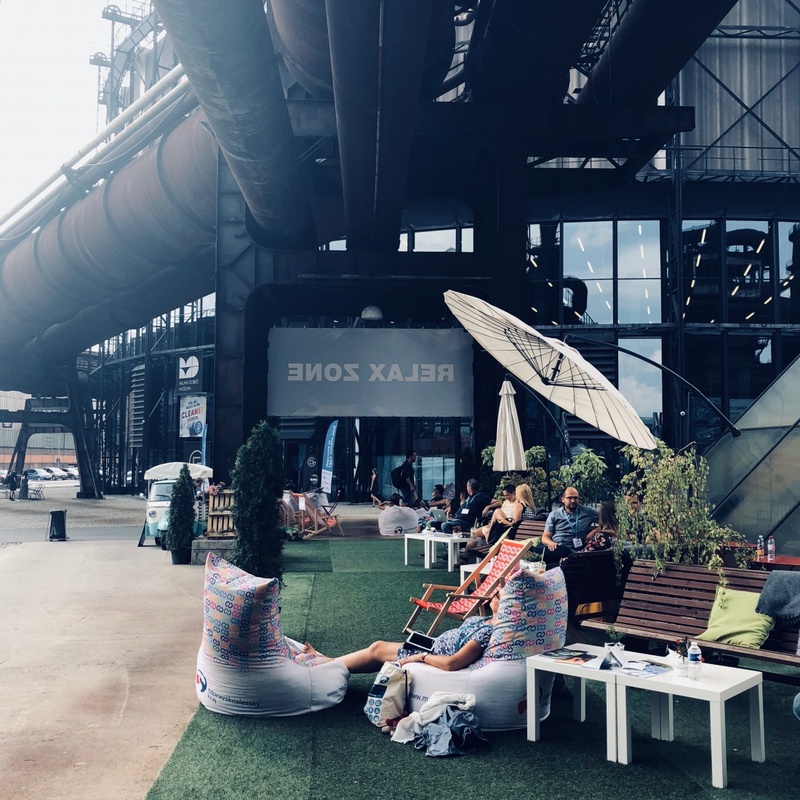 Posted in Diversions, On The Road and tagged bloggers, conference, Czech Republic, Moravia, Ostrava, TBEX, TBEXOstrava2018, Travel, writers. One of the few photos of my own talk on the first morning of the conference. I was a little nervous and a little hungover from the opening party the night before, but I think it went well. Photo credit: TBEX. 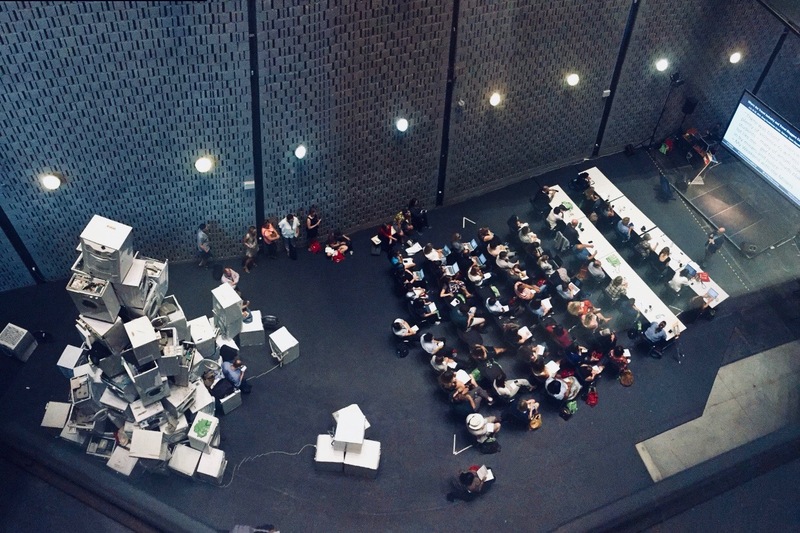 I actually loved the room for my presentation. On the left is a stack of discarded washing machines from Czech installation artist Krištof Kintera that stood two or three stories high. It gave the room a strange energy. Photo credit: TBEX. My presentation originated from an “Introduction to Travel Writing” course I developed for Prague’s Anglo-American University. 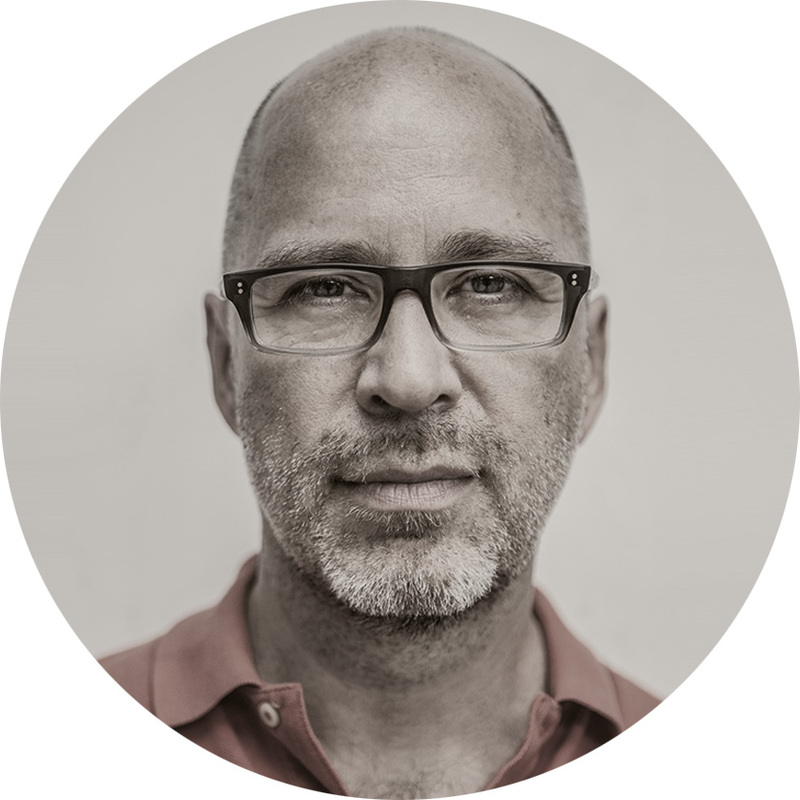 I designed the lecture to give writers of all levels some simple and practical advice for how to comprehend unfamiliar destinations quickly and, in the process, generate articles that are better-written, better-informed, and more rewarding. Too many travel articles and blog posts present only a superficial treatment of a destination or regurgitate tired clichés that may not be accurate. I live in Prague – a city of a hundred spires (tired cliché) and a thousand travel articles – and I know how poor and uninformed many articles actually are. To be sure, I don’t always blame the writers. The problems are built into the model itself: a writer receives an assignment and parachutes into a destination he or she may not know well (if at all). At the same time, they are expected to generate content that’s unique, informative, and fun to read. It’s an impossible task. Many of the points I’ve outlined are simple common sense, but together they represent a logical framework for approaching and understanding a destination efficiently. They can help writers to build a portfolio of knowledge for articles they're currently working on and also provide a base for revisiting destinations in the future. That approach, though, strikes me as plain wrong. Writers should view guidebooks not as “guidebooks” per se, but as “textbooks” to a destination. A good guidebook is a highly structured piece of writing that’s intended to cover a destination in a logical and comprehensive manner. Indeed, a good guidebook is the quickest and most efficient way of learning all phases of a destination. I don’t mean that we should simply replicate the content of guidebooks in our articles and posts, but rather we should view them as tools and reference materials. As kids in school, we didn’t learn math or science by googling or reading blog posts – we used a textbook. The principle is the same when it comes to understanding a destination. 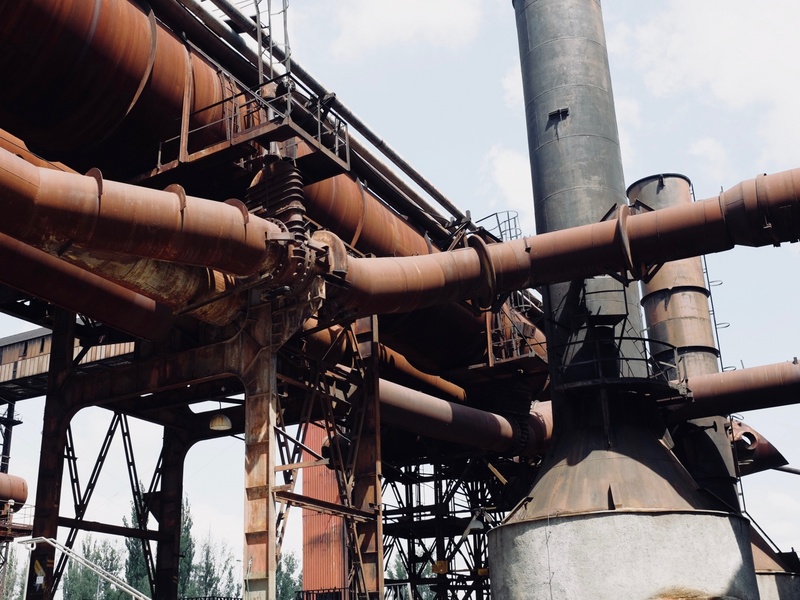 The venue was the Gong conference center at the decommissioned Dolni Vitkovice steelworks. 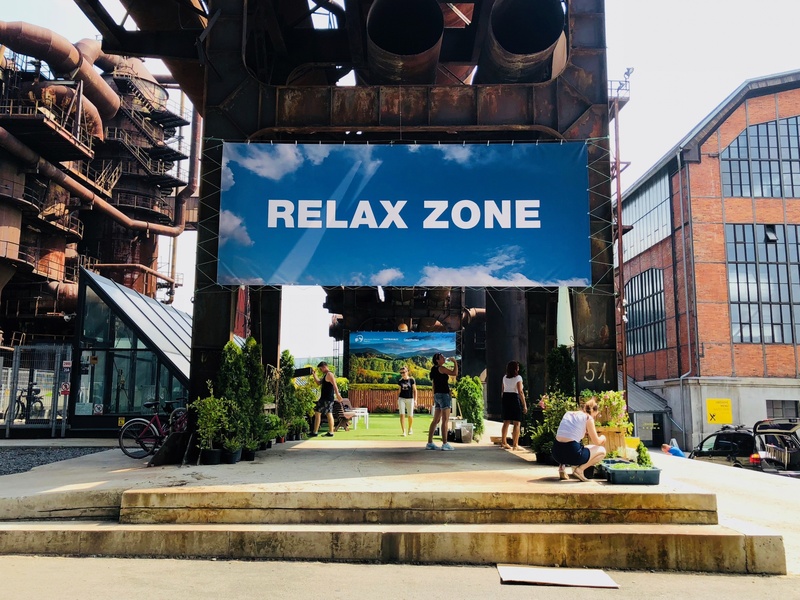 Ostrava made the wise decision not to knock down the old steel mill, and it makes for a great place to hold an event. Photo by Mark Baker. A close-up of part of the Dolni Vitkovice steelworks, just outside of the main door to the Gong conference center. Photo by Mark Baker. 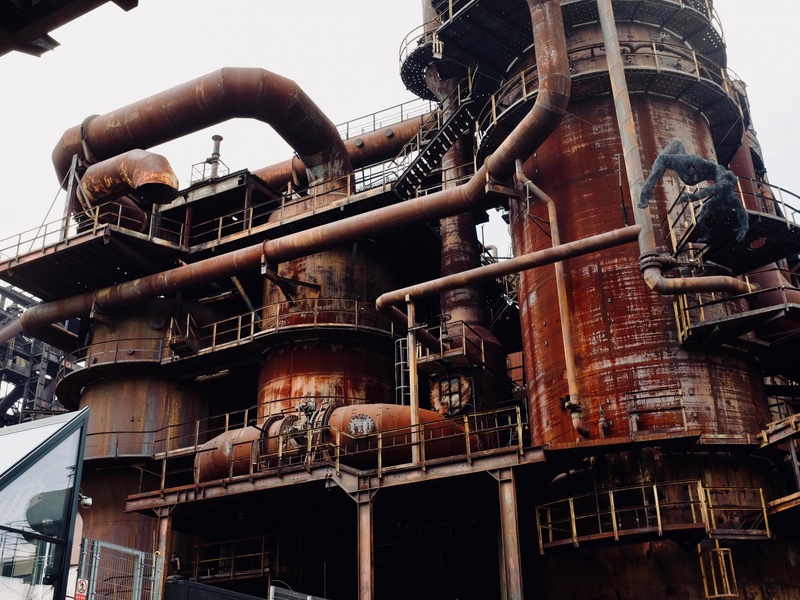 One of several shots here of the Dolni Vitkovice steelworks, where the TBEX conference was held. Photo by Mark Baker. 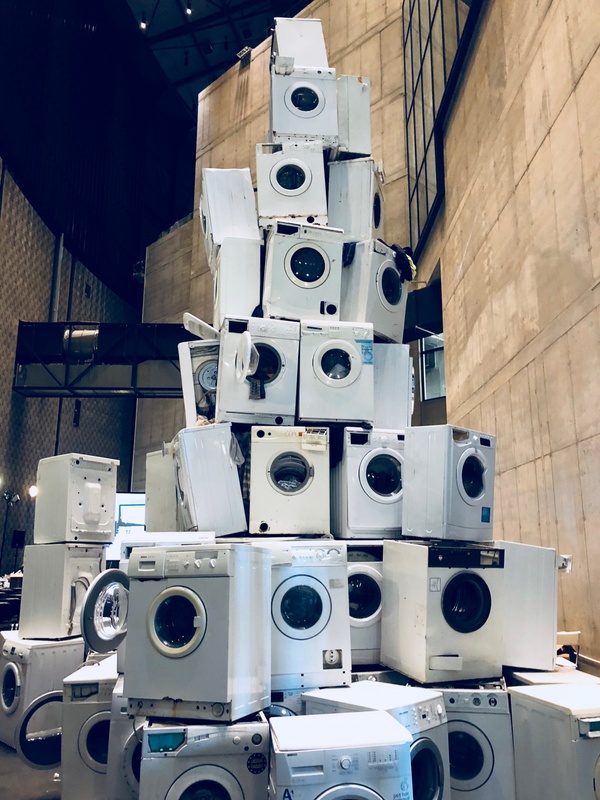 Czech artist Krištof Kintera's stack of used washing machines. They actually work and when I was testing the microphone and slide set-up, they started running. The noise was deafening. Photo by Mark Baker. This is another point that sometimes elicits groans. No one wants to be a “tourist.” In fact, we often (unfairly) criticize tourists in our posts with cringe-worthy lines like: “Our blog is for travelers, not tourists,” etc. By being a tourist, I mean making a point of visiting the top sights a city has to offer. Tourists go to the Eiffel Tower, to the Tower of London; they ride to the top of the Empire State Building. In Prague, being a tourist means lining up to see Prague Castle or ponying up to visit the Old Jewish Cemetery. There are at least two good reasons for being a “tourist:"
First off, a city’s top sights are top sights for a reason. They’re part of the essence of a city. Even if a writer doesn’t plan to cover a particular sight in his story, it’s fair to say he'll never fully grasp the place if he doesn’t make an effort to see its premier attractions. Secondly, being a tourist can help writers to understand their readers better. It’s a truism of good writing that in order to write well one must not only know the subject well, but also the audience. We don’t often think of travel writing or blogging in this way, but as a writer or blogger we’re actually agents of our readers. In fact, in a sense we are our readers. And to truly know that person, we must try, in some way, to become that person ourselves. Travel writers have an obligation to their readers to learn everything they can about a destination. This might include subjects as wide-ranging as geography, history, architecture, literature, culture, politics, transport, and restaurants. The list is endless, and a good writer must transform his or her mind into a sponge. Too many travel articles and blog posts lack sufficient contextual or background information on a destination to help readers understand a place or to answer readers’ natural question about why they should care about a destination in the first place. The reason for the omission is usually obvious: the writer himself doesn’t know the subject well enough to explain it. This is a common flaw of many blogs as well as popular user-generated content sites, and it comes through immediately in the writing. To illustrate what I mean, I'll use architecture – a frequent subject when writing about Central Europe. A writer might learn from a visit to Prague that the city has “magnificent Gothic architecture” or that Olomouc has “beautiful baroque statues,” and then might parrot back that information faithfully in his article. Yet, he may not have any idea at all what the terms “Gothic” and “baroque” actually mean. It’s a rule of good writing that if the writer doesn’t understand a concept, he cannot expect the reader to understand it either. As they say in journalism: "Show don't tell" -- and before you show you have to know. TBEX conference organizer and all-around good guy Shane Dallas addresses the crowd on opening day. Photo by Mark Baker. The 'speed dating' section was the event's bread and butter. During these sessions, tourist boards and companies meet with bloggers to discuss possible cooperation. Photo by Mark Baker. 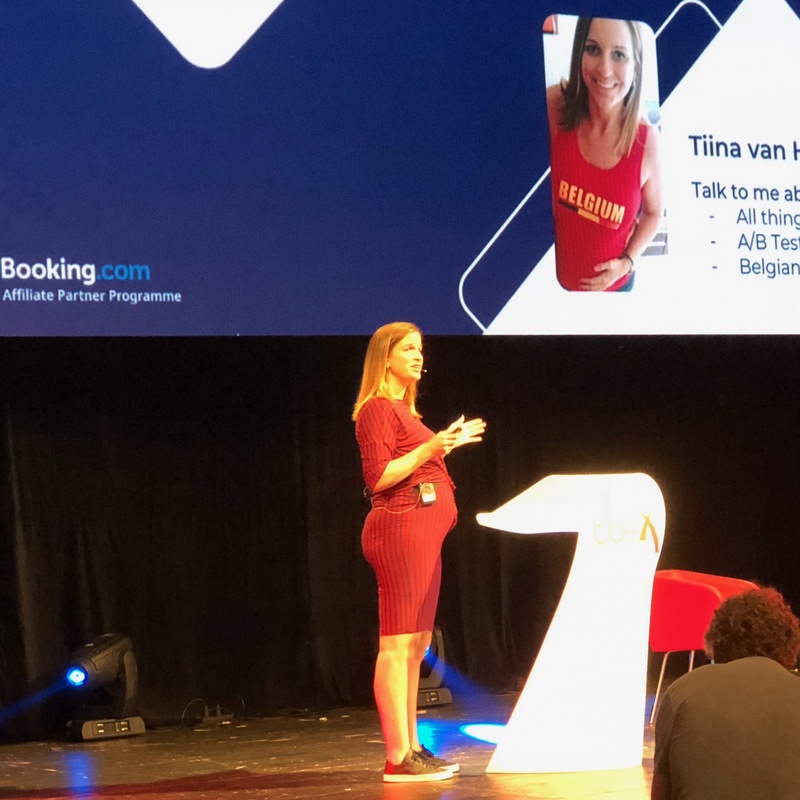 A visibly pregnant Tiina Van Hecke from Booking.com gives the keynote presentation on world travel trends. Photo by Mark Baker. 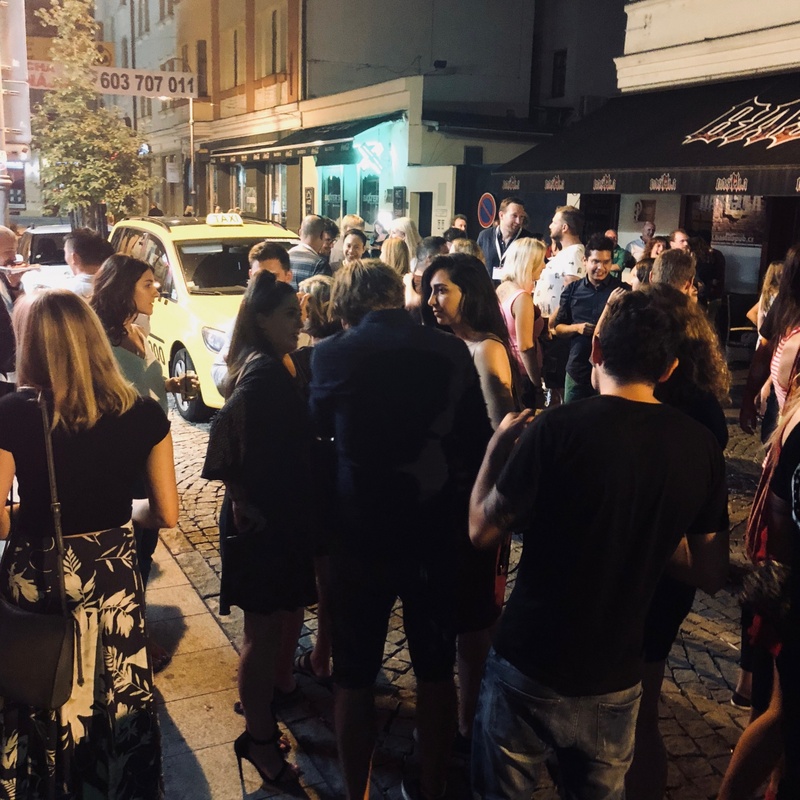 This was from the closing party on Stodolní ulice -- Ostrava's famed pub-crawl street. Photo by Mark Baker. The best travel writing evokes a sense of place in the reader, and the best writers achieve this sense of place through descriptive writing that uses detail to paint mental images. Details, in fact, are the bread and butter of travel writing. It seems to be a cruel law of human memory, however, that writers can never remember details if they don’t write them down. We need to train ourselves to become highly observant of our surroundings, and to develop the habit of noting down characteristic details as soon as we see them. No detail is too small. Supplement your notes and observations with a dedicated diary of your reactions and feelings, and update it daily if possible. This is advice I sincerely wish I’d taken when I was younger in order to have a database of memories I could pull from to illustrate my blog posts now. Over the years, I’ve maintained diaries of one sort or another, but I was never as disciplined as I should have been. Writers should use their diaries to record the dates, places, routes, and people with whom they were traveling, as well as the general situation and mood. Concrete details tend to be more useful over time than aimless meanderings about life choices (that unfortunately make up a lot of my own surviving diary entries). Diaries are useful in several ways: They’re invaluable for reinvigorating faded memories and can help to add personal elements to a post or article – by this, I mean feelings, reactions, and moods that humanize a story and make it relatable. Over the longer term, writers need to think hard about where they want their own writing to take them – perhaps there’s a memoir or history book in the cards somewhere down the road. Everyone will live through amazing times – it can’t be helped – and good writers prepare themselves from the start to write about these periods long after they’ve actually happened. 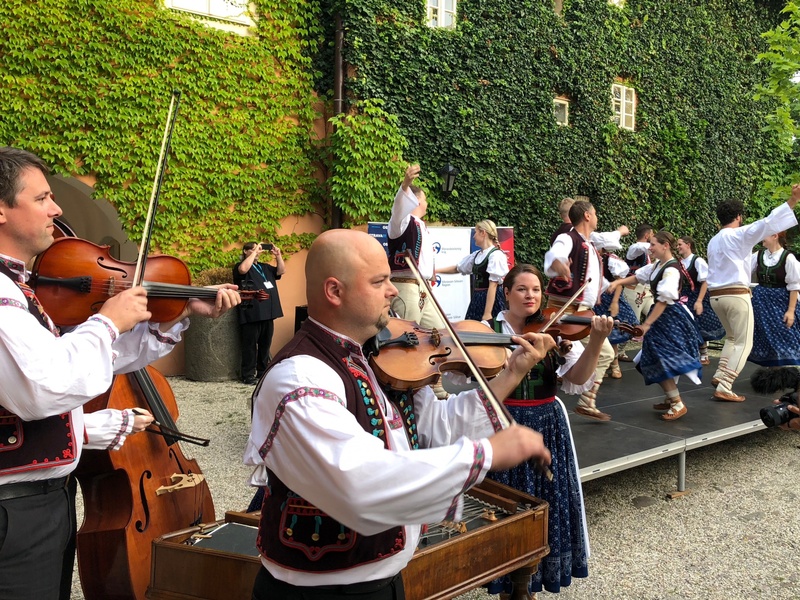 The opening party featured some Moravian-Silesian folk music and dancers. Photo by Mark Baker. 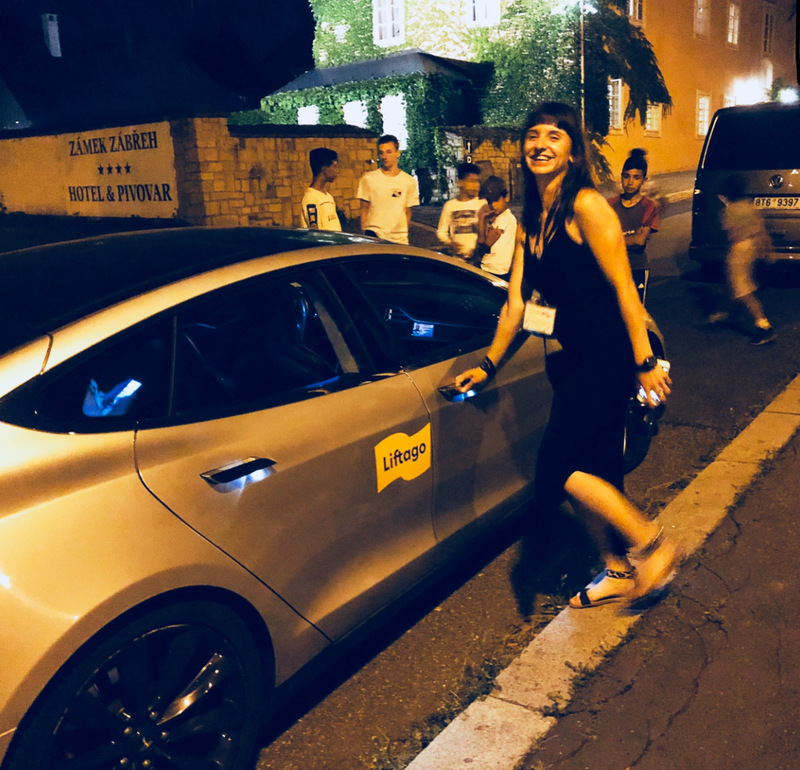 My first-ever ride in a Tesla was here in Ostrava with Eva from Liftago's Prague office and fellow conference-speaker Denisa (pictured). Photo by Mark Baker. Great coffee, ice cream, and bean-bag chairs parked just outside the main door to the conference center. Photo by Mark Baker. A little oasis of green outside the conference venue during one of the hottest three- to four-day stretches of the summer. Photo by Mark Baker. While in a destination, writers need to think rationally about how they intend to use their images in their articles and blog posts and to spend their photography time wisely. The goal is to build up a comprehensive database of high-quality, usable images. Photos in travel articles and blogs play, roughly, an analogous role to quotes in a newspaper or magazine article. Like quotes in a newspaper, photos help writers prove to their readers that what they are writing about is actually true. First off, it’s important to remember that photos and images should never contradict the text, but rather harmonize with an article’s facts, tone, and themes. If you intend, for example, to write that Venice is beautiful, but crowded, be sure to take photos of crowds. If you want to describe Prague Castle as “majestic,” then take a majestic photo. This all sounds simplistic, but it’s important. As I go through the process of writing my own blog, it’s a constant source of frustration to find I lack the photos that really help make my points crystal clear. Avoid too many selfies or photos of friends, which are mostly unusable in professional settings. Focus instead on constructing a photo library that’s as neutral and comprehensive as possible. It will save you time and money in the long run. Remember when you take a photo with your own camera or phone, the image belongs to you, and you can use it as you see fit. That’s not the same with images you find online – which usually require prior approval (and sometimes a fee) to appear in print or online. My last point here is something a little different. To write well, it’s not always enough to know the subject or the reader well, the writing must also somehow come from the heart. When good writers connect to places through their hearts – and by this, I mean through their interests, hobbies, and passions – the writing feels (and is) more authentic and satisfying. In my travel-writing class at Anglo-American University, I ask my students to take an internal audit of their own special interests and hobbies and look for ways to incorporate them into their articles. We all have these types of interests. For some this might mean a special type of music, like maybe hip-hop, while others might enjoy rock-climbing, astronomy, foreign languages, film, history, or whatever. To carry the hip-hop example a step further, an article on five influential Czechs who are changing local music culture would be far more interesting and informative than an article on five burger places near Prague's Old Town Square. My advice for budding writers: if you have a hobby or passion, find a use for it in your work. Your posts will be livelier, more passionate, and ultimately better informed. 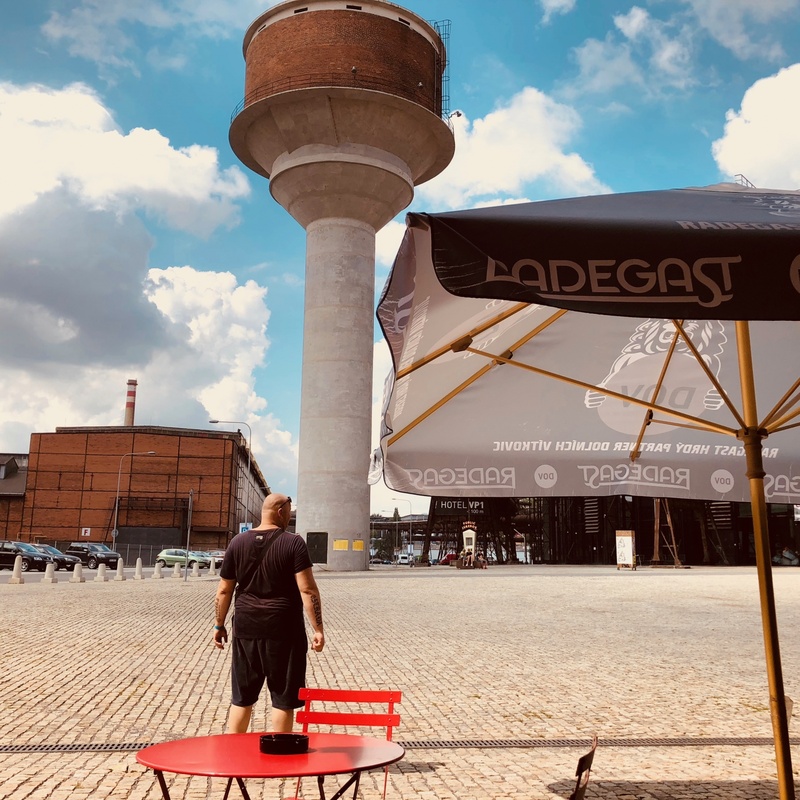 For an earlier article I wrote on what to see and do in Ostrava, check out Ostravaganza 2018!!! Hello! — That looks fabulous, and I’m sorry that I missed it. 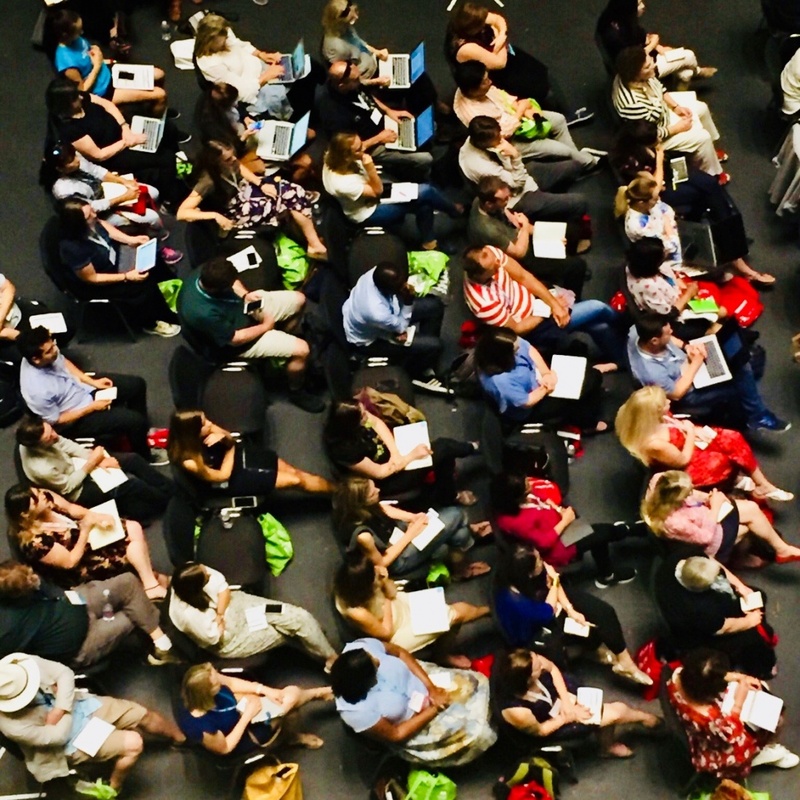 Are there any other travel blogger conferences you would recommend? Hi David, TBEX will be in Fingers Lakes later this year and back in Europe next year in June (I believe). Stay tuned and hope to see you at the next event. We’ll shortly be announcing TBEX Europe for 2019, so please stayed tune David! Great tips Mark! You definitely were a helpful guide to many of us. Hi Gemma, Thank you for leaving a comment and I’m eager to see what you are up to these days! I was at the presentation. It was great. I enjoyed it a lot. Very good tips. I hope all of the speakers do a blog like this. It will give me 1000 ideas more to work on. 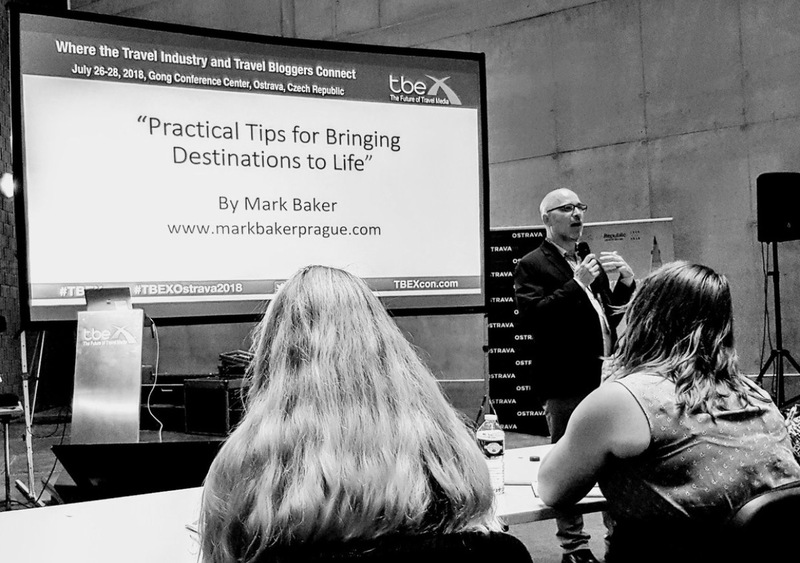 As Conference Director for TBEX Europe I receive a lot of feedback about the sessions and the feedback from your session was incredibly positive – you have a real gift for presenting and sharing your knowledge about travel writing. 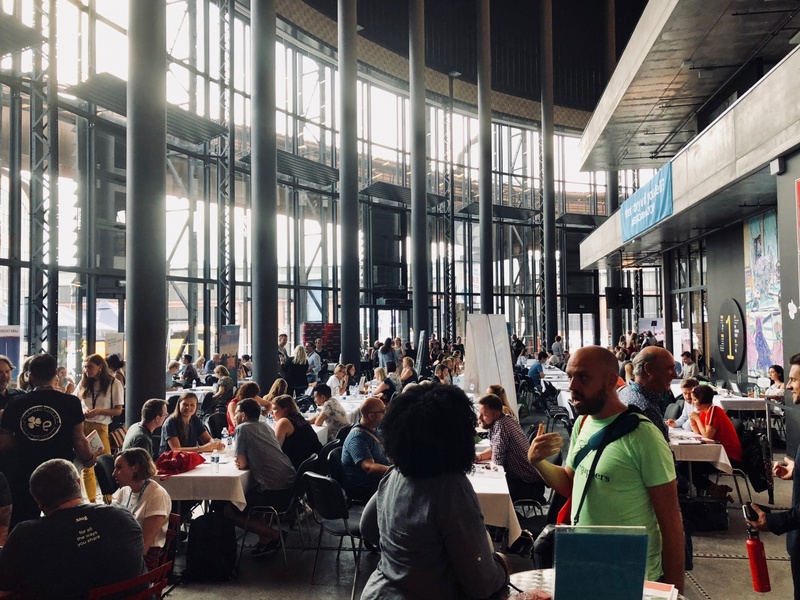 Thank you for your fantastic contribution to TBEX Europe 2018 – a contribution that ensured the success of the event. Hi Sylvia, have a great time. This past TBEX was also my first. Met lots of amazing people.